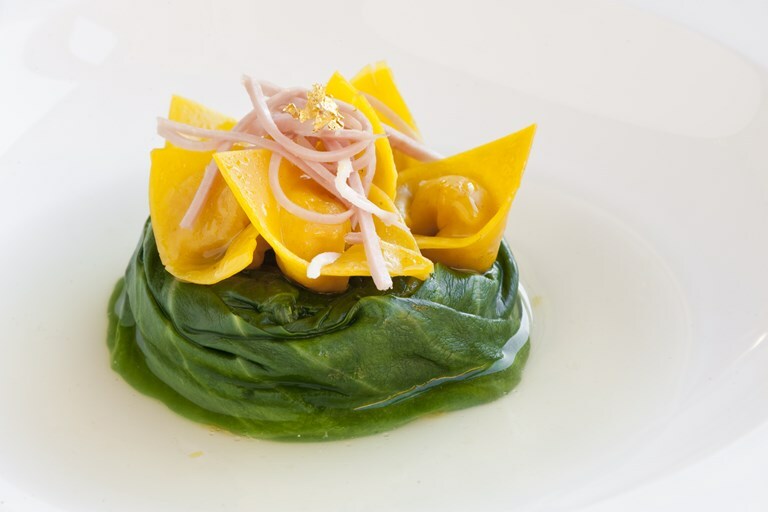 Referring to the 'marriage' of meats and vegetables in this rustic broth, chef Giuseppe D'Aquino brings a traditional Italian wedding soup into the modern kitchen with chicken tortelli pasta and vibrant Swiss chard. A dusting of gold leaf is optional, although does make this truly special. By giving up on a promising career as an engineer and following his dream of becoming a chef, Giuseppe D'Aquino took a huge gamble. One Michelin star later, that gamble seems to have paid off.